I’m also interested how they will handle the the solo bits from Fragile. I just today received my tickets for the Cleveland show in the mail. When I saw the band this past summer they opened with Close to the Edge. I would expect that they would open up again with it this summer rather than Fragile as Roundabout would be an unusual show opener as you pointed out. I’ve also been wondering what the “greatest hits” portion will entail. GIven the time restaints I would doubt they would cover any material from Tales or Relayer. They just covered the material from Going for the One on the 3 Album Tour. Would they do any Tormato or Drama material? Tempus Fugit? I can’t see Howe wanting to cover any of the Rabin era stuff but I may be wrong. That leaves the obvious Yes album material. So many posibilities. I would love to hear your thoughts. Chris, I think Roundabout would be a great opener. According to Forgotten Yesterdays statistics, Roundabout opened the early shows of the Fragile Tour. I’m very jealous. I’d love to hear all that – particularly the new material from Heaven and Earth! I have honestly never liked the solo song fragments on Fragile. They mar an otherwise terrific album. 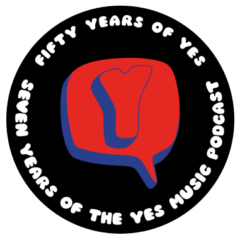 Now over 40 years later, Yes are faced with the task of resurrecting this filler material just for the sake of a satisfying a recent nostalgic trend of playing entire albums. Not that they have a choice. After Yes Album, Close to the Edge and Going for the One, Fragile, and possibly Drama, are probably the only other entire LPs that I can conceive this line-up would be willing to play live. I have no idea how Yes will choose to perform them, but if I were in the band, I would decide for some radical reworking. What have Yes always done with their song fragments? They stitched them together into complete songs. Why not do the same with the Fragile solo material? If Yes wanted to do something truly innovative and refreshing for this tour, then Jon could sing We Have Heaven over Alan’s 5% Percent for nothing rhythm, all with some funky bass that turned into a bit of a guitar jam that sounds suspiciously like Mood for a Day (played on Steve’s electric Gibson like he does with his solo band), then maybe trading some rocking keyboard licks inspired by Brahms, then the bass taking over and turning into a Fish jam, then after Schindeeria Primawhatever a reprise of We Have Heaven. A gamble sure, but it is a chance to surprise the audience and do something interesting with some material that, with exception of Fish and Mood for a Day, was never intended to be played live. If the band insists on being faithful to the LP and slavishly playing each solo song as we all remember them, then there is always the option of performing them with live looping. Loads of younger bands are doing them, and the technology allows for a truer live experience over triggering pre-recorded tapes. But I hope they do not go this route. Applauding after a 35 second song will be 5 percent of awkward. It’s a fascinating idea, Joe. I can only imagine what kind of remixing could be done! Could be fantastic. I really like the thought about live looping. I have seen this done successfully by a surprising range of acts, including an entire performance of Tubular Bells by two (only two) Aussie musicians (look for Tubular Bells for Two), and Mitch Benn (a UK musical comedian smuggling in a serious piece.) Now I come to think about it’s surprising none of Yes seem to be big on sound-on-sound. I’m sure its way above my understanding that’s for sure. I wonder if its due to the fact that these are all short little tracks I really dis like the word filler I don’t believe for a moment that yes would need filler tracks to bring to a live show, especially with the music library that they posses. and really after all these years I believe we should all be happy that they still want to perform live..
I’m sure you will have a blast at the show and I cannot wait to hear your review.. Surely they would play all the songs except the Rick, Jon and Bill solos. Mood for a day, and The Fish have been included in many gigs, so are central to their repertoire anyway. You’d think so…but according to various interviews I don’t think that’s the plan…could be ‘interesting’. Next Next post: Tim Stannard’s YMP Teeshirt hilarious video!